Are you in mood for a spinach pie ? Try this spinach and feta pie recipe . It’s easy to cook , ready in 120 minutes . 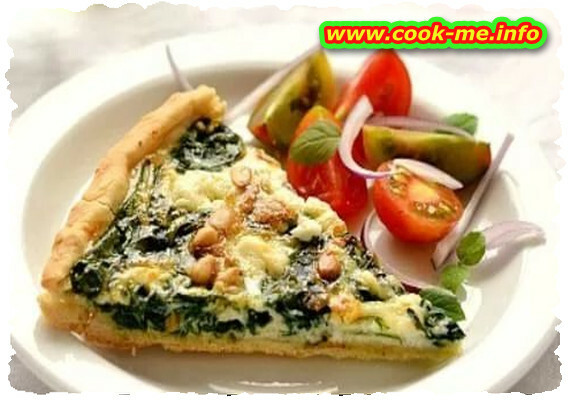 For the spinach pie with feta cheese and sour cream mix the flour with salt, dry yeast, add oil and milk gradually, knead until we get a smooth and elastic dough. Cover the result and leave it aside for 40 minutes. Wash the spinach leaves under running cold water, then scald the leaves about 3 minutes with boiling water with salt. Chop the green onion and fry it with chopped spinach and 1 tablespoon of butter. Leave it to cool then mix well with crumbled feta and grated cheese , well beaten eggs, 1 teaspoon of semolina, spice it by taste. Stretch the dough into round sheet, place it in the tray (and walls) greased with oil and dusted with flour. Prick the dough with a fork in several places then pour the filling. Beat the egg well then pour it over and add grated cheese on top. Put the tray with spinach pie , feta and sour cream in the oven at medium heat until is nicely browned ( about 40-50 minutes ).